Which origin is shifting? Yes, the examples come with speed control. In your example you're just setting the attached track and nothing else. Check out the construction script, there are functions that take care of all this logic for you. The flow needs to be set the track in the carriage and then set it for the bogies, since they are ones that actually move the carriage down the track. See the 'Attach to track' and 'Refresh positions on track' functions. You can use those for exactly what you want, or if you need something more custom, you can make a copy of those functions and update it to your needs. Hope that helps, shout if you've any more questions. Currently i'm fighting with some issue. I want to spawn a mine cart in REAL TIME and attach him to the nearest track and let him go forward, so i wrote some code to achive this. Last edited by Romansky'; 05-27-2018, 07:26 PM. Got some questions about this... Do this work with world shifting origin ? And do come with a sample that the player can control the train or something on forward and backward and speeds ? On spline points: You don't need to use the slow right click menu, you can just drag new spline points off using the standard spline controls. Check out the official Unreal docs for info on these. Could you link to where the docs cover thanks features? Thanks! The official docs can be a bit sparse at times, but all the spline controls are pretty much the same, so if you look at a couple of their spline docs you'll get everything you need. To add points just hold down alt on a selected point and drag to create a new point. Then just experiments with the point and tangent controls to get the look you are after. [QUOTE="PolygonJelly;n1452413"]On spline points: You don't need to use the slow right click menu, you can just drag new spline points off using the standard spline controls. The speed will change depending on the incline, E.g. it will slow down going up a hill. You can set the coaster to use constant speeds, then use the trigger to set the max speed. Check out the trigger example map, or the trigger blueprints. Here you'll see how by getting a reference to the train we can apply the brakes or change the speed. So, you'd have your train on the map, set to stopped. Then add an ordinary trigger and get a reference to that train, then when the trigger is overlapped, release the brakes and set it to moving. You can even set the current speed if it needs to be moving at that speed as the player comes around the corner. To shorten my question - How would I get the train to run on overlap, as opposed to BeginPlay? Very much got the hang of working with the plug-in now, it's been incredibly useful, so thank you for that. I have one last question though. My project is VR based, and I have a rideable rollercoaster with a camera, that becomes active when the motion controller pawn/player overlaps with a box trigger. My issue is that by the time the player reaches this point, a significant part of the coaster track is missed. Is there anyway to make it so the train doesn't begin moving on play, instead starts moving upon the player character overlapping with a box-trigger? I've been trying to set it up for a while now, but with no success. Would this involve working with the level blueprint, or the track/coaster cart blueprint? i used the example coaster map and changed the max speed of the speed triggers. But the problem is the speed also changed at some points of the track but there where no speed triggers. Why is that? If you have any follow up questions after reading that, let me know. + the new mesh must have no collision.=> fine. Now i'm wondering what is the most convenient way to have the baked copy of a complex tracke positioned in the proper position ? The "most convenient" process i found was to make a copy of all the elements (while rendered) then bake them together and chose the option "replace Source Actors"
Still it's easy to reposition the track on the exact spot. 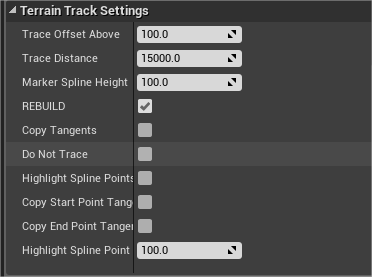 Once done: i select all the pieces of track (the copies) involved in the baking and i set active "Disable Mesh Building"
Is there a better way to do this ? in a way that the baked track would appear just exactly in the same spot as the merged actors ? I tried playing with option "Pivot point at zero" and selecting the 1st piece of track first but it did not helped in streamlining this baking process. Streamlining this process can be especially useful when you have to bake and adjust several times your final track. Actually it was not obvious for me that i needed to make a right-click on the white line and press "add spline point"
so for others wondering posting that here. The terrain track has been updated since the tutorial video was made for launch (1 year ago). The red lines you see appearing are the line trace lines, when you move the track it will fire a line to see where the ground is underneath the point. The points, are spline points, so just drag a new spline point off your spline to add it to the track. Check out the terrain examples map to find a bunch of examples with multiple tracks and options. Thanks, glad you're liking it. Yep the objects are moving in the Unreal world as normal, so what ever collision they have will be used. If you open the maps with a third person character you can have them walk inside and they will move with the carriage. Same if you throw physics objects in there, they move with it. In settings i don't see the same options as in the video like "point count"
Last edited by Ignibit S.A.; 03-28-2018, 10:02 AM. I just realized you added a cable car up date to the package, this looks amazing. I'm curious if you are able to have physics objects that can sit inside of train cars? I haven't seen any demonstrations of this. Would be a lot of fun to hook this together in VR. Thanks!